Penpals, presents and new friends. As you get older it’s hard to make new friends. (sorry kids – it’s the truth). People get busy with jobs and families, friends move, free time lessens. Many will argue that with all our technology people are becoming even more isolated. We text rather than pick up the phone, we email rather than write a letters, we use abbreviations (IMHO) and speak in 140 character soundbites. I can’t disagree. But this past month I made two new friends. And I made them with the most fabulous combination of old school and new school communication methods. I saw a post on twitter, exchanged a few emails, wrote a letter, mailed a box and got a different box back. In short, I got two penpals! 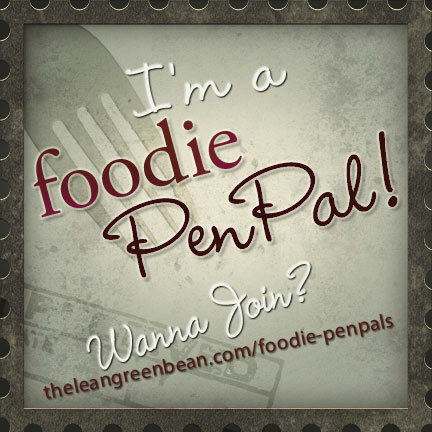 The foodie-penpal program is a fun throwback to the old school penpal programs of my youth. Started by Lindsay at The Lean Green Bean it’s super simple. You sign up through her site then on the 5th of the month you get your penpal pairing via email. You get in touch with them, get all the information you might need (allergies, diet restrictions, address etc) to put together a super duper package ($15 maximum!) and you have until the 15th of the month to mail your box of goodies and then you try and prevent yourself from stalking your local postie until your package arrives. Finally on the last day of the month (i.e. today), if you’re a blogger, you post about the goodies you received from your penpal. The boxes can be filled with with whatever catches your fancy and makes sense for your new penpal. For example beef jerky is probably not appropriate for a vegan, or pasta to a someone who eats Paleo. But fun “foodie type” things, local food items or even homemade treats are perfect. The box also needs to include something written. Anything from a note explaining what’s in the box, to a fun recipe. Not a blogger? No worries. It’s open to normal people too! If you’re a reader and you get paired with a blogger, you can choose to write a short guest post for your penpal to post on their blog about what you received or simply just send them a thank you note. If two readers are paired together, neither needs to worry about writing a post for that month. The best part is is you get to meet two new people – the person you mail to and the person who mails to you! I had great fun putting together a list of questions and then mailing a package to my penpal Jodie Layne. She seems like a very cool lady and you can read more about her on her blog Naked in the Kitchen. 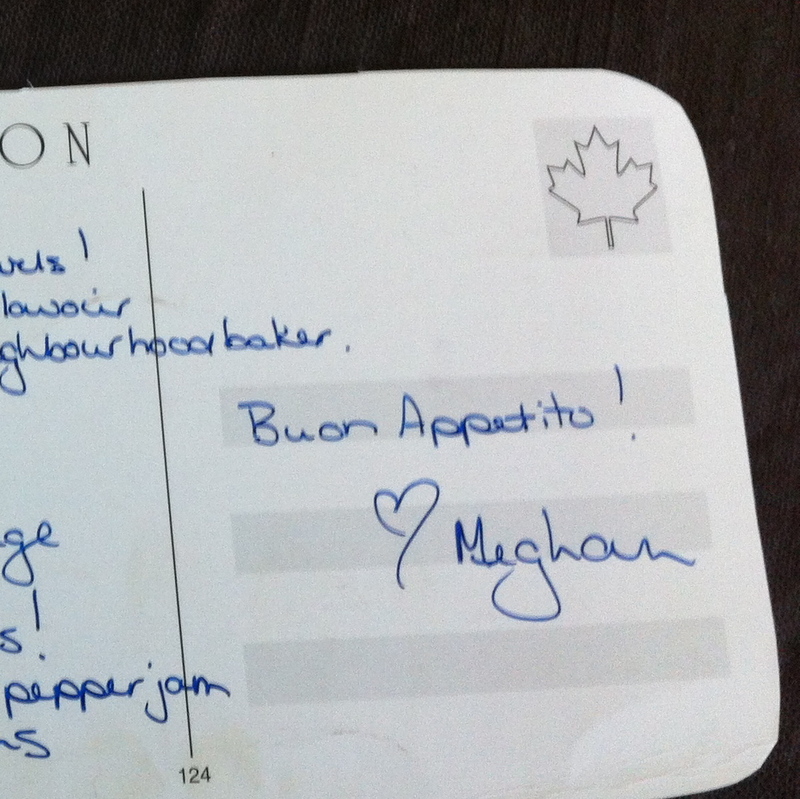 As an aside, I should add she doubled the pleasure by sending me a thank you note in the mail (!) when she got her package. Sending a parcel to Jodie was really fun and just as much fun was coming home and seeing a parcel waiting for me on my front porch. I knew I was getting something from someone named Marissa, but other than that I new nothing. Now Marissa is one of the sane people out there who doesn’t have a blog so to be fair, I can’t tell you lots about her. What I can tell you is she sure has good instincts and read me right! My penpal parcel from her was filled with thought and fun things. There were a couple lovely types of tea. There were yummy (and addictive!) 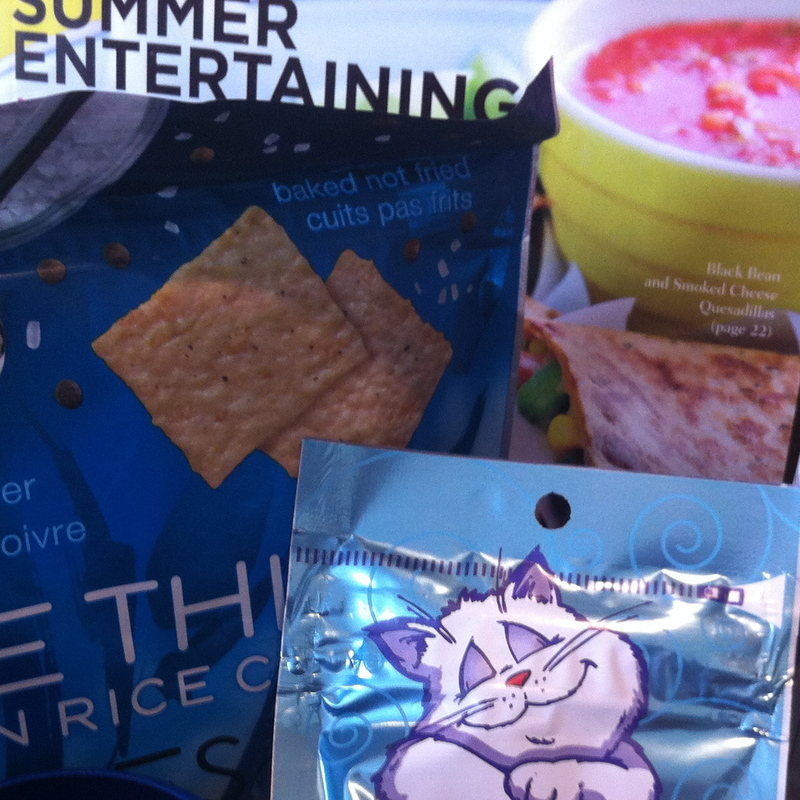 rice crackers and even the Canadian Living special Summer Entertaining edition! And there were gluten free, organic chocolate chip cookies of which I have no picture because they were eaten too quickly when I was having some of the tea. Sorry…. But to be fair the best, and most thoughtful, part wasn’t even for me. It was for the two that really run the roost around here. My cats, Gibson and Audrey. Truly. 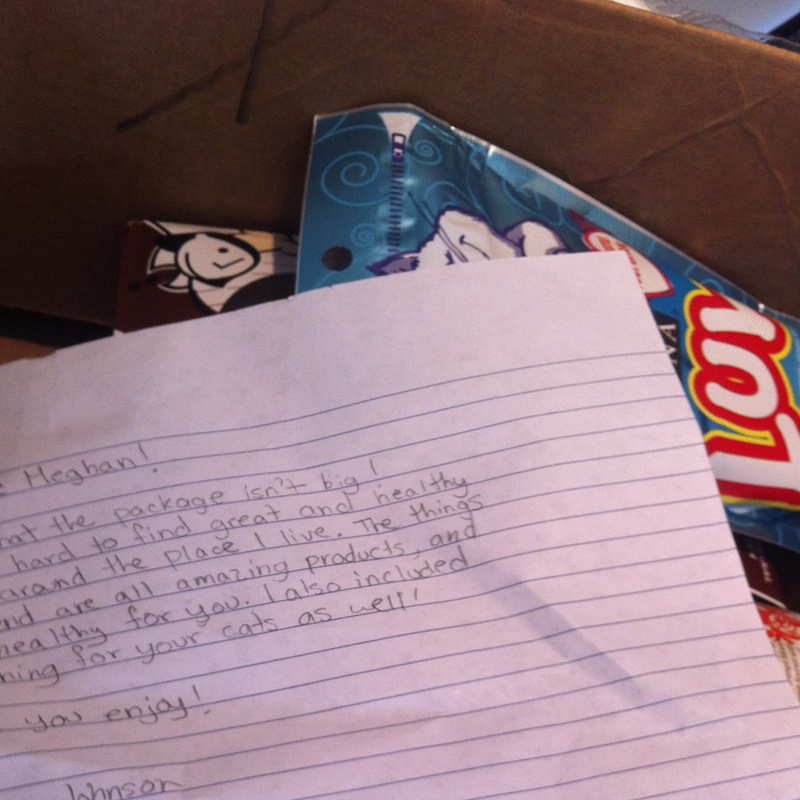 Marissa even sent them some treats. Awesome. They aren’t so great at sending thank you’s, but I assure you they know exactly where I have them hidden and I actually think they have attempted to be on their best behaviour so they will get more. I’m sending out a meow on their behalf. It is funny, I think I have enjoyed writing about this as much as I did the experience. I realize that maybe it is because we are disconnected these days. Little is a surprise anymore. Things are tweeted, and blogged and facebooked (is that a word?) and everything is so instantaneous and anonymous. If I’ve gained anything from this it is the reminder that small, little surprises don’t happen often enough and they make people smile. And really, what can be wrong with that? This entry was posted in Food, Friends, Mail and tagged cats, cookies, penpals, tea by mostlynoodles. Bookmark the permalink. This is amazing!!! I LOVE it! Thanks! 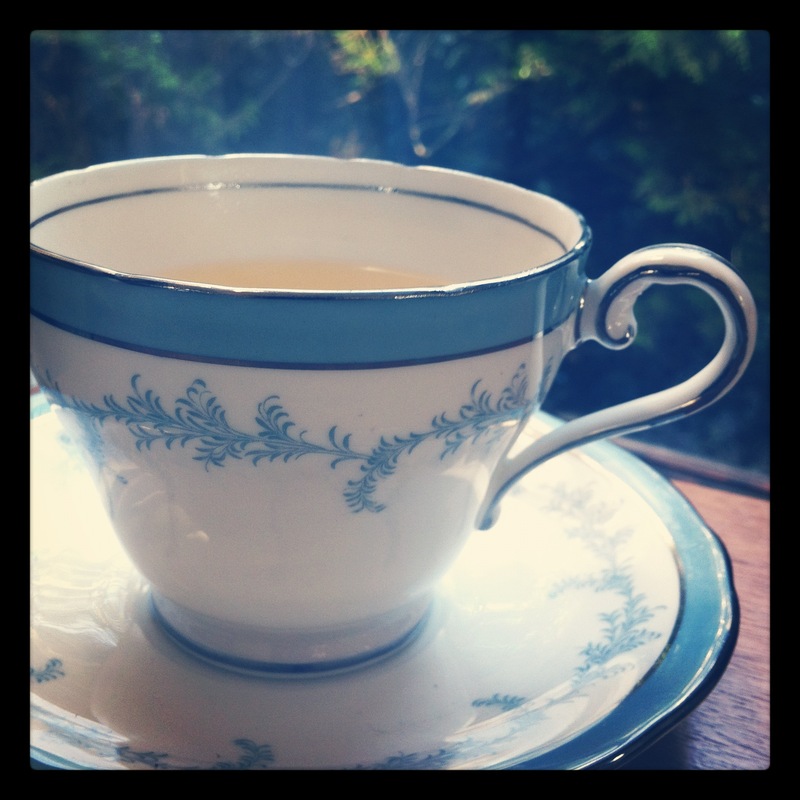 It’s fun to feel fancy drinking from a tea cup instead of a mug! Fun! Maybe I should do this! Love the teacup. I enjoyed meeting you at BlogHer Food in Seattle! Let’s do it again! It is fun! I was just packing up my June box this morning. Really great to meet you too. Doing it again is a must.